The Hungarian University of Fine Arts has been uncovering and processing its Art Collections for over two decades, in parallel with ongoing research on the history of the institution. The University regularly makes the results of this undertaking accessible to the public and to scholars in the form of exhibitions, publications, and online. This present show can be regarded as a continuation of the exhibition held in 2016 (www.mke.hu/fotomodell/). While the aim in the previous exhibition was to offer a comprehensive presentation of the rich material comprising the photography collection, the present show takes a significantly different approach. What we are interested in, within the context of the Art Collections, is who used photographs, who took them – or had them taken – when, how and why? Who at the Hungarian Royal Drawing School (the institution which preceded the HUFA) was engaged in photographic activities? What did they think of this new medium? What was it good for, what was it not suitable for? What do the photos themselves have to tell us about the former institution and its actors? In finding answers to these question, it helps to invoke the atmosphere, tastes and thinking of the era: to have a closer look at the milieu in which these photos were – and can now – be found, and to which they pertain. At the same time, we can gain insight into the intensively changing visual world of the period between the 1860s and the 1910s and the basic transformation that occurred during this time in art and the public sphere, as well as in the visual industry and its products. The exhibition showcases artworks and documents – originals and reproductions – arranged into thematic groups. During the preparatory stage, one of that questions that gained considerable importance was what should be regarded as original in case of a photograph of historical significance. Should it be the object itself or the “light-information” it captured (the purpose for which it was taken), which has been changing, fading and transforming through the years. In this present exhibition, we have decided to liberate, in some instances, the traces left behind by once-existing spaces of light from the trap of actual sizes and tone values. Loaning Institutes: Budapesti Történeti Múzeum – Kiscelli Múzeum, Fővárosi Szabó Ervin Könyvtár – Budapest Gyűjtemény, Szépművészeti Múzeum – Magyar Nemzeti Galéria Adattár, Semmelweis Orvostörténeti Múzeum. HUFA Barcsay Terem, Budapest, 1062 Andrássy út 69-71. The Cyclorama of Hell was presented to the public in May 1896, on the corner of (what was then known as) Arena Avenue and City Park. The inventor of the concept – who was also the director and marketing manager of the project – was none other than Géza Gárdonyi. Inspired by the success of the Feszty Cyclorama and by Dante’s Divine Comedy, which he was in the process of translating at the time, Gárdonyi had the idea of creating a cyclorama of Dante’s Hell. 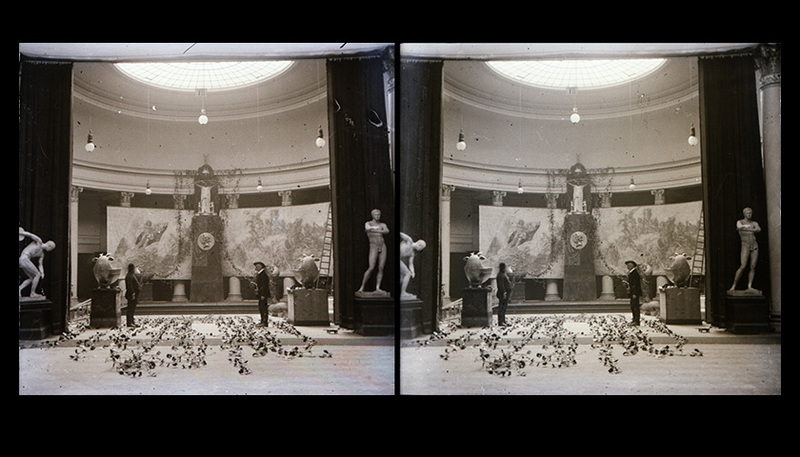 The Cyclorama of Hell, created by scenographers Árpád Molnár and Károly Trill, sculptor Miklós Ligeti, and others, opened its doors – albeit somewhat hastily – and, thanks to Gárdonyi’s zealous marketing activities (articles, songs, marches, etc. ), it received its hundred-thousandth visitor by mid-June (see Kiállítási Újság [Exhibition News], 28 June 1896). 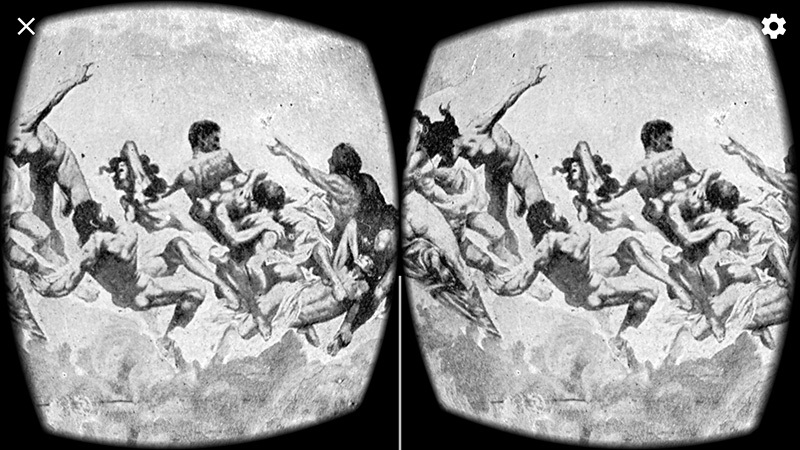 The Cyclorama was essentially lost, only the illustrations from the book entitled Hell (which Géza Gárdonyi translated) are known to us today, which were taken from the paintings of the Molnár-Trill cyclorama. 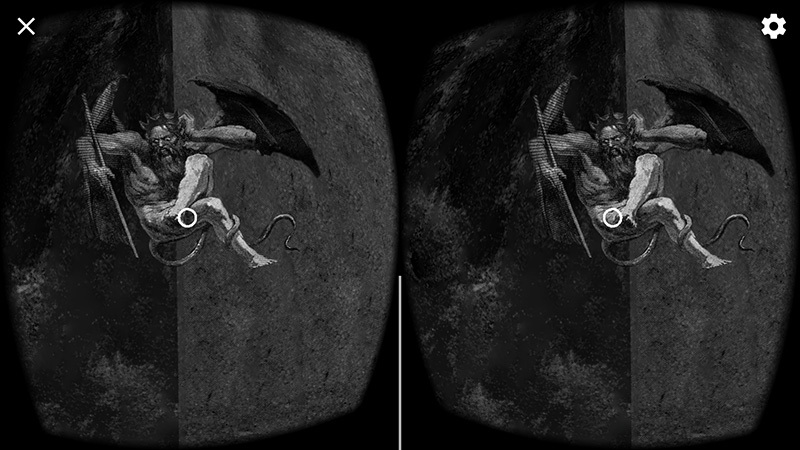 Using these images, and with the help of virtual reality, I have created a kind of reconstruction of the Cyclorama of Hell. 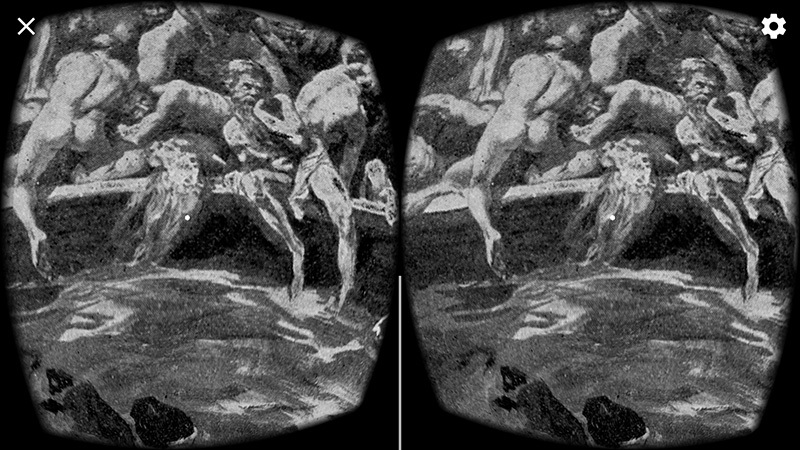 The application allows the viewer to walk inside the images of Hell, while listening to the tunes of the march entitled Go to Hell, composed – as per Gárdonyi’s request – by Pista Dankó. János Horvay created Budapest’s first Kossuth statue, which he received an award for in 1908, and which created quite a stir back in the day. 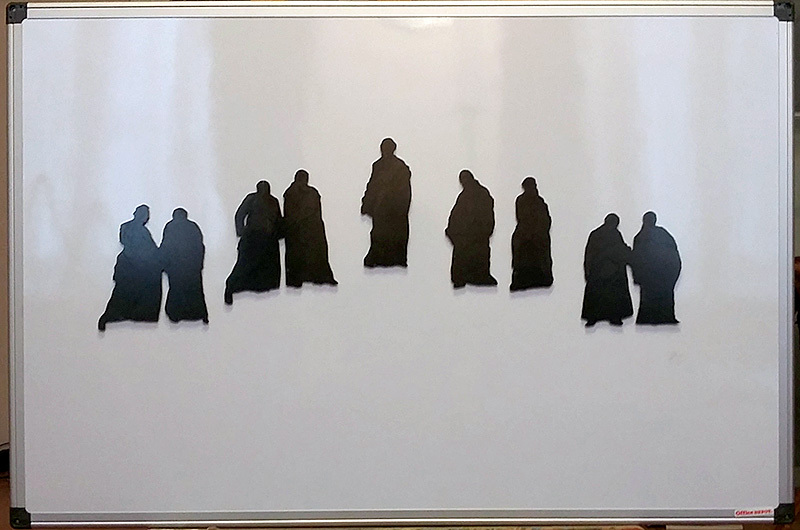 I lifted the figures of the sculpture out of their environment and placed them on a whiteboard using magnets. The installation allows visitors to interact with it; to rearrange the figures and freely create an environment for them. In case of any public sculpture, those designing the space around it must think about what they wish to communicate to passers-by through their chosen mode of arrangement and their relationship to the sculptures. They must also take into consideration how the constructed environment can influence the relationship between the individual figures of a statue. 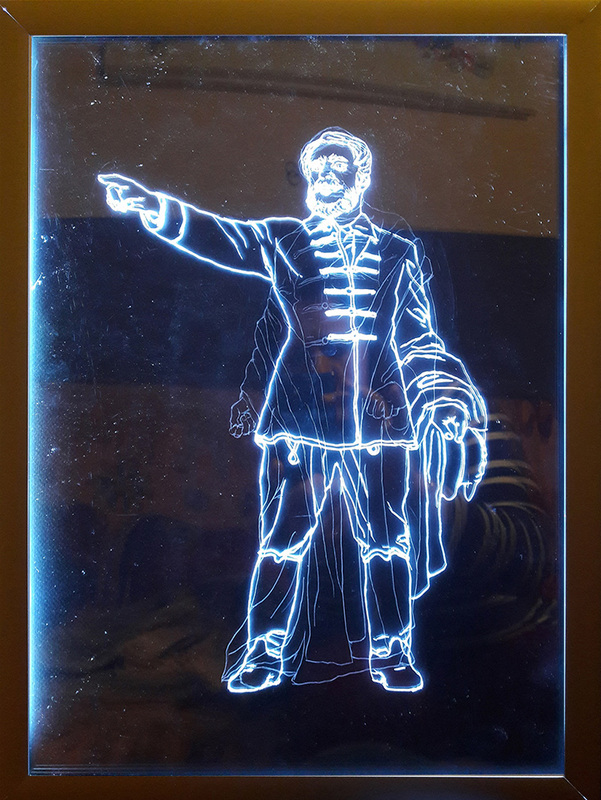 It is thus an interactive installation; I would like to encourage visitors to rearrange the figures and use the provided pen to freely create their surroundings. If possible, please document the changes you have introduced by taking a photo, and send it by email to ujrarendezes@gmail.com. Thank you. I based my work on Mór Erdélyi’s 114-part photo series from the Art Collection of the Hungarian University of Fine Arts, which documents the artworks submitted in response to a call for sculptures of Lajos Kossuth, announced in 1908. 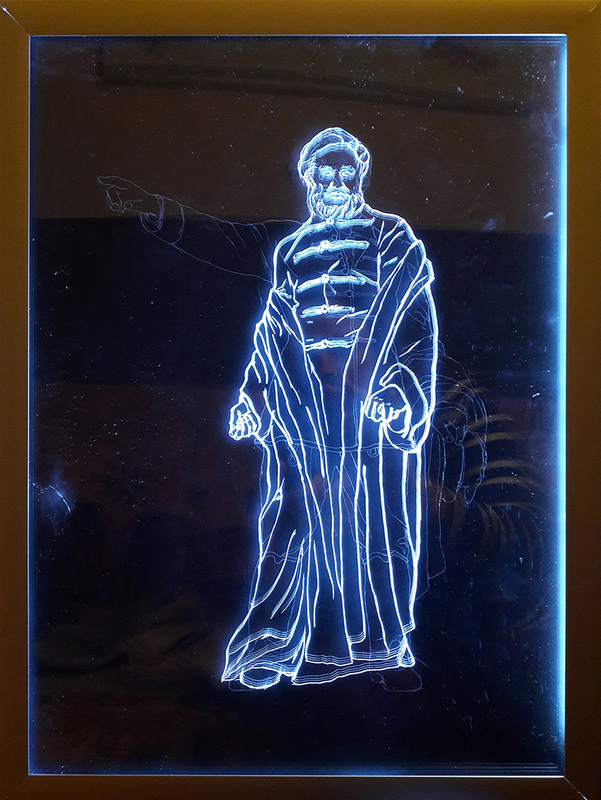 When making my selection, I felt it was important to choose a public statue that still exists today, so that I can examine the afterlife of the artwork depicted on the photo and look at its current condition as well as the changes its surroundings have undergone. It was for this reason that my choice fell on the photos documenting the award-winning entry: János Horvay’s Kossuth statue. The Kossuth statue displayed in front of the Parliament building on Kossuth Square is a replica whose original version was erected in that very spot in 1927. 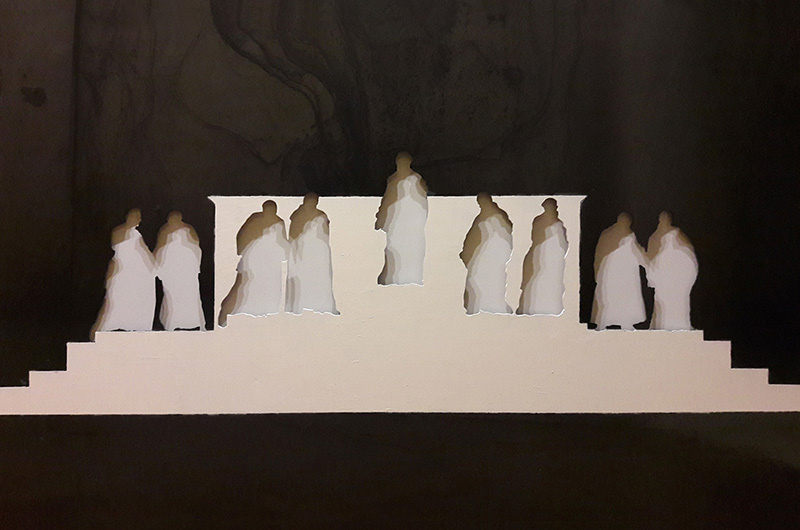 János Horvay’s original sculpture, composed of a number of figures, was disassembled and shipped in pieces, without a plinth, to Szigeterdő in Dombóvár, where it still stands today. In 1952, Horvay’s sculpture was replaced by Zsigmond Kisfaludi Strobl’s Kossuth statue, which has also disappeared since. 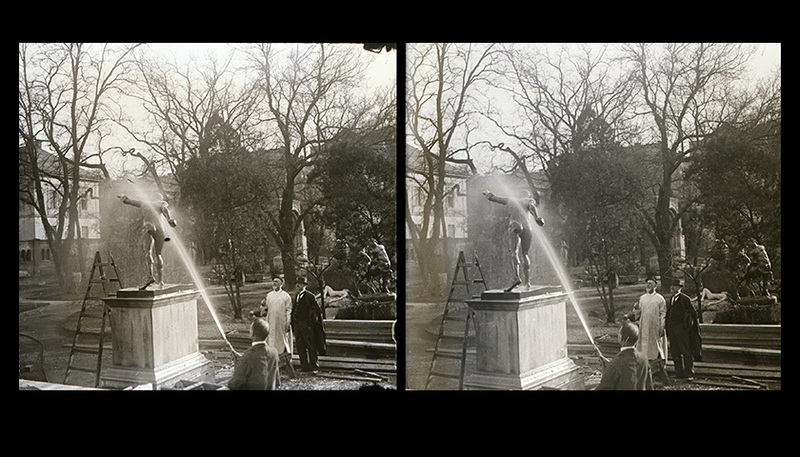 Its figures were re-erected (without their original base) in Budapest’s Orczy Garden. Shifts in the politics of memory gave rise to changes in the representation of Lajos Kossuth as well. 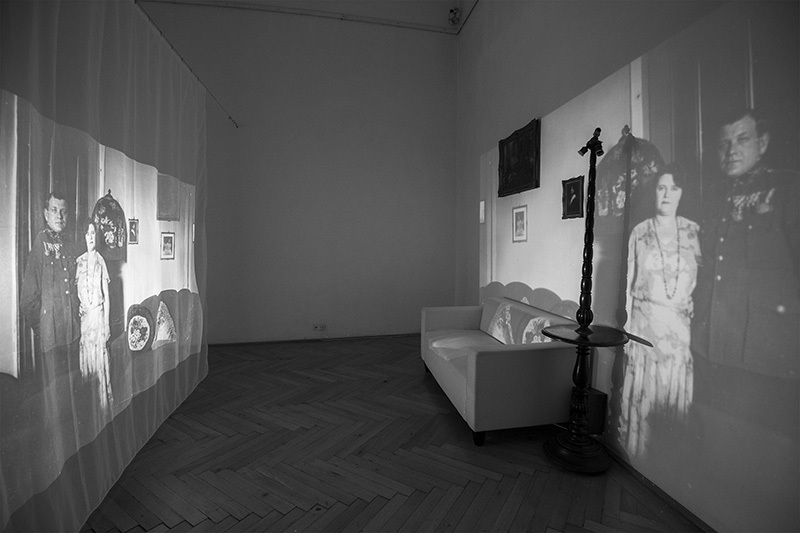 The installation shows alternating images of the main figure of the Kossuth statue, as depicted by János Horvay and Zsigmond Kisfaludi Strobl. How many generations does it take for a person’s memory to fade completely; how long can memory be salvaged through our objects? Mária Wendt obtained her certificate from the Hungarian Royal School of Model Drawing and Teacher Training in 1920. I, as her great-grandchild, earned an MA degree in 2015 from the same institution – now the Hungarian University of Fine Arts. In the meantime, along with the turns of Hungarian history, our family too has undergone significant changes. As a result of the loss of territories, our family was torn apart, and after living in hiding, it lost all its wealth and social status. But, after two generations, there is an artist in the family once again – though I have never met my great-grandmother. As of the 1910s, my great-grandmother recorded her experiences in photographs, which she then arranged into photo albums. These documents, as records of historical periods, point from private life events to collective happenings. I have only partial knowledge of the events captured by the photos; they have mostly been forgotten for all eternity. My grandmother, in the role of the mediator, speaks about the narrower and broader events that weave through the story of our family by looking at these photos and objects that have been salvaged. It is at this point that history becomes enmeshed in the tangles of personal memory. 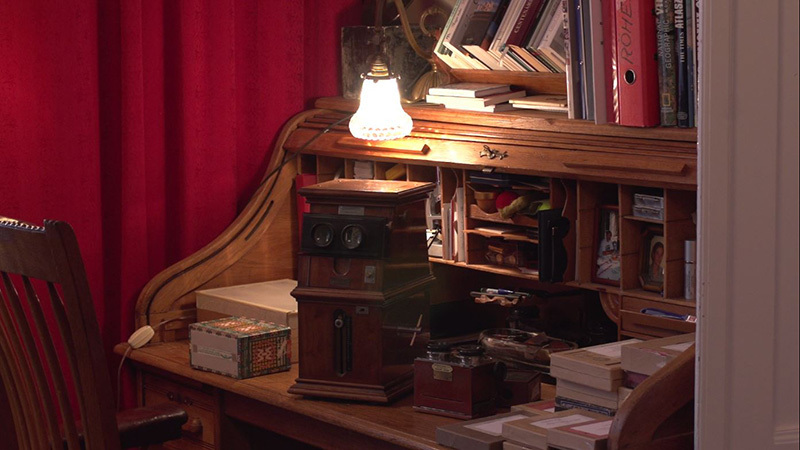 In the installation, I use a few family objects – or relics from the “Granny Museum”, as my grandmother likes to refer to them – and personal stories to reconstruct faded memories, that can now only be partially pieced together. Manuel F Contreras was born in Colombia and has worked in documentary filmmaking both independently and commercially. Currently based in Budapest, he pursues a PhD degree in arts. He also works as a film selector for a documentary film festival and researches Latin American documentary film production. 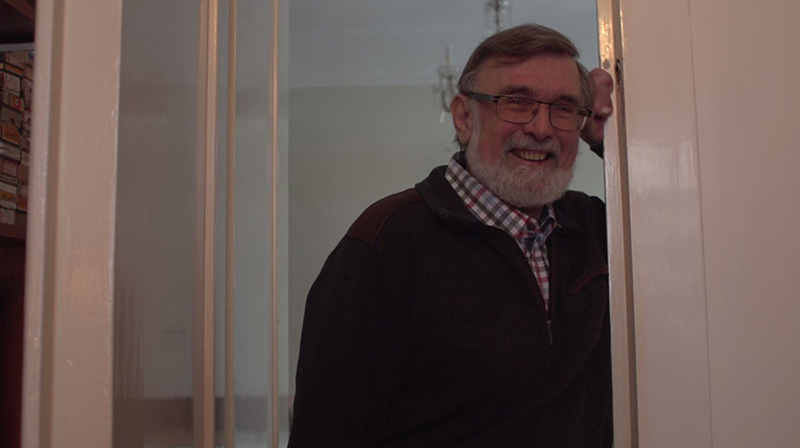 The film presents a few pieces from the valuable Strobl estate from a special vantage point: Mátyás Stróbl, grandson of Alajos Strobl, talks about the artworks in his own home, which include not only sculptures, but paintings, photos, stereo photos and drawings as well. Alajos Strobl was not the only artist in the family: his siblings Zsófia and József, as well as József’s wife Marianne (Maria Nentwich) and Alajos’ wife, Alojzia Kratochwill were also artists. 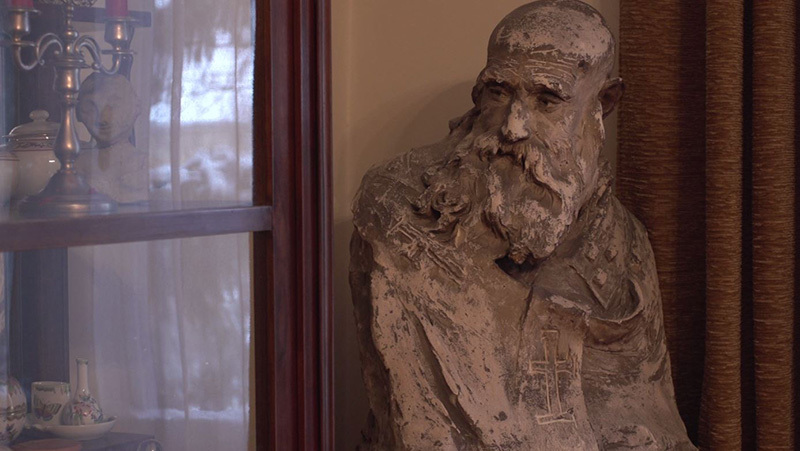 The estate is presently handled by the family: Mátyás Stróbl and his brother Dr. Alajos Stróbl are writing a book series about the art of their grandfather, the sculptor. A few years ago, they had the memoires of their father Mihály Stróbl published (The Granite Lion – Alajos Strobl), which remains the definitive resource for those wishing to study the life of the Strobl family and the artworks of the famous sculptor. No comprehensive monograph of Alajos Strobl has been published to date, although some steps have been taken in that direction. Nonetheless, no one has taken on the task of processing Strobl’s art at the scholarly level. It is to this – as well as to the other artists in the family – that we wish to draw attention with this film. 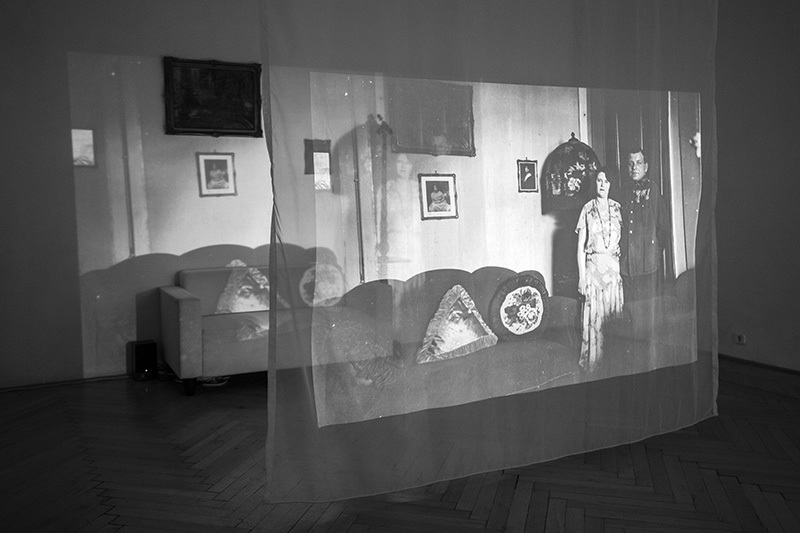 The stereo photos presented in the projection were taken by Mrs. Alajos Strobl (maiden name: Alojzia Kratochwill), who, between 1903 and 1927 took photographs of her husband’s works and documented their lives together on a regular basis. 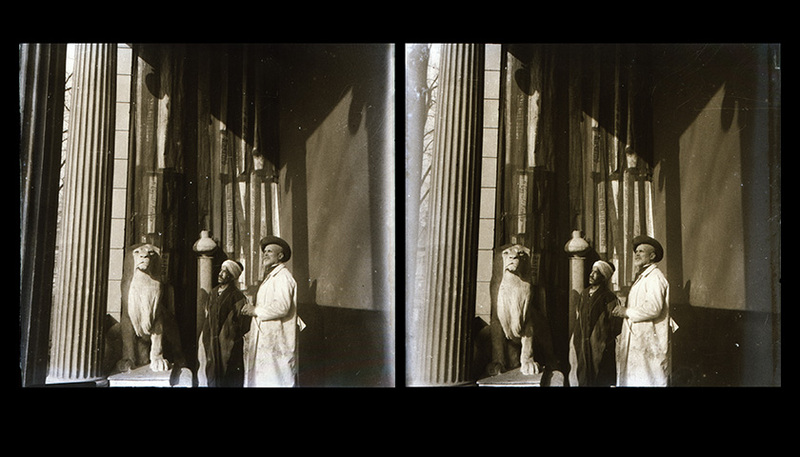 The stereo photographs capture something of the experience of viewing the sculptures in three dimensional space, thereby creating an intensive sense of travelling back in time. 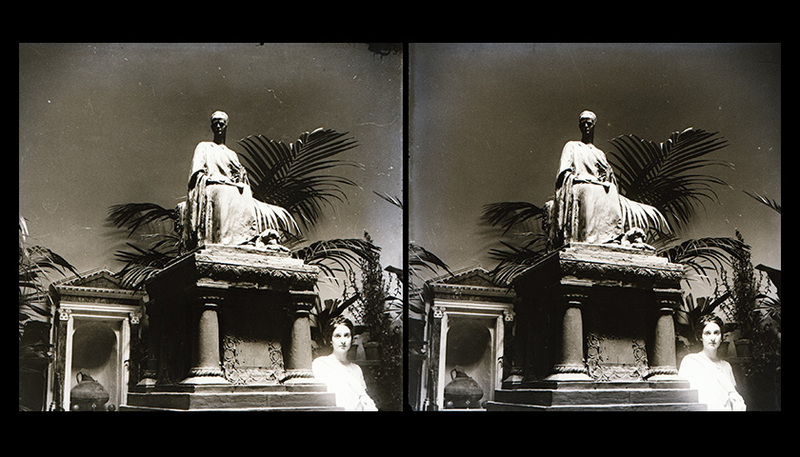 A significant portion of the photos were taken in Mulberry Garden, either in the building that today still functions as a sculpture atelier of the Hungarian University of Fine Arts, or in certain areas of the garden. The projected images are primarily photos from Mulberry Garden – and are thus closely related to the University’s history – with special regard to scenes where a sculpture is in the process of creation and has not yet assumed its final form, perhaps shown together with the model or artist. 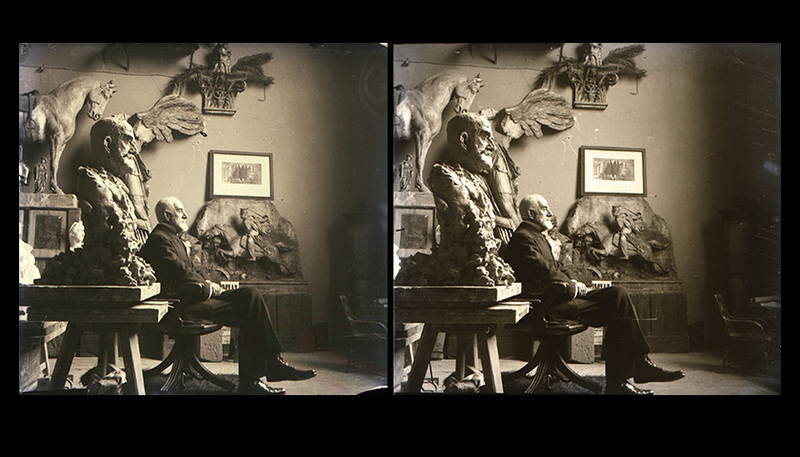 There are also photographs of sculptures that have not been preserved, such as the portrait of Gyula Széchenyi, or the fountain sculpture of the so called “Icelandic woman”, modelled after Danish student and suffragette Leuvey Asmusen, who was in Budapest as a participant of the International Women’s Congress in the spring of 1913. In the audio guide, Mátyás Stróbl, grandson of sculptor Alajos Strobl and amateur photographer Alojzia Kratochwill, shares his thoughts about the photos. Visitors can take the small, black stereoscopes into their hands and view the stereo photographs on the cards by placing the card into the rectangular card holder and viewing through the lenses. The backside of each card contains brief information (photographer, place, date). While through the stereoscope that is combined with the audio guide mostly photos from Mulberry Garden can be seen, the stereo cards offer other views as well, including the Strobl residence and its environs in Upper Hungary, some sites the Strobls visited during their travels abroad, the marble mine of Ruszkica/Rușchița, and the Lotz exhibition at Műcsarnok/Kunsthalle Budapest (1905), for which Alajos Strobl created the decorations. During my trip to Rome in 2016, my most memorable experience was beholding the virulent colony of ailanthus trees (Ailanthus altissima) growing on the ruins of the Forum Romanum. In the area, formerly referred to as Campo Vaccino or “cow pasture”, the ruins were mostly covered with earth and a natural growth. Then, beginning in 1803, as a result of the Grand Tour and Piranesi’s prints, the ruins became of interest again, so the layers of soil and plant life were cleared off. Thus, the three visual components of the site became the deteriorating crumbling stone and terracotta remains of antique Rome, the aluminium structures put in place to conserve them, and the ailanthus trees breaking them down and transforming them into a natural habitat. 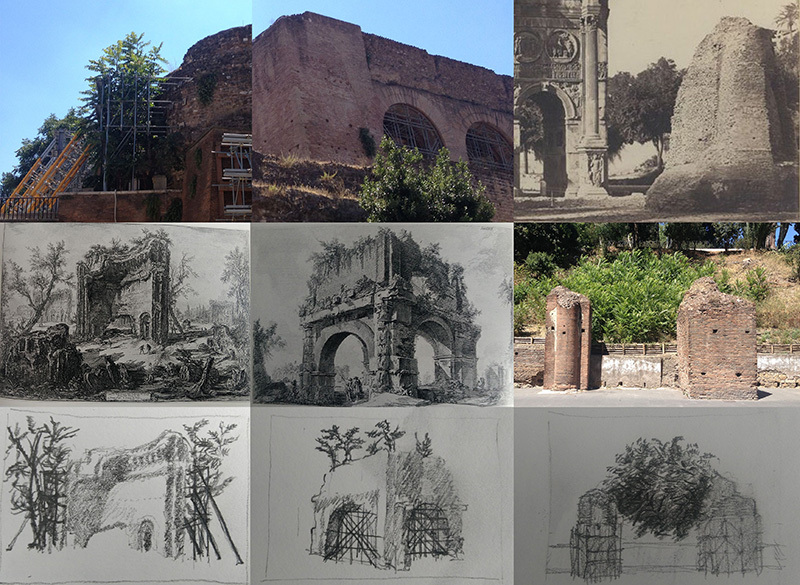 Two previous stages of the area’s plant growth can be observed in Piranesi’s engravings and in late 19 th century photographs. 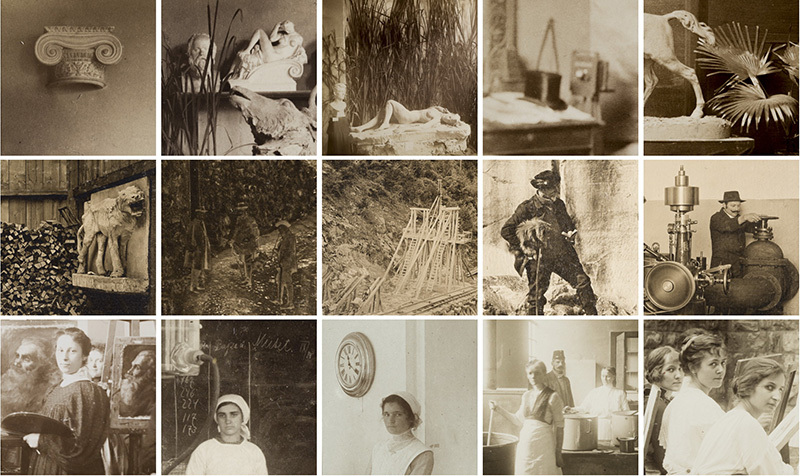 I examined individual pieces of the photography collection of the Hungarian University of Fine Arts in search of details that were otherwise not their most accentuated elements. The central motif of each composition will attract the attention of anyone who picks up these original photographs or the reproductions of photo albums presented at the exhibition. 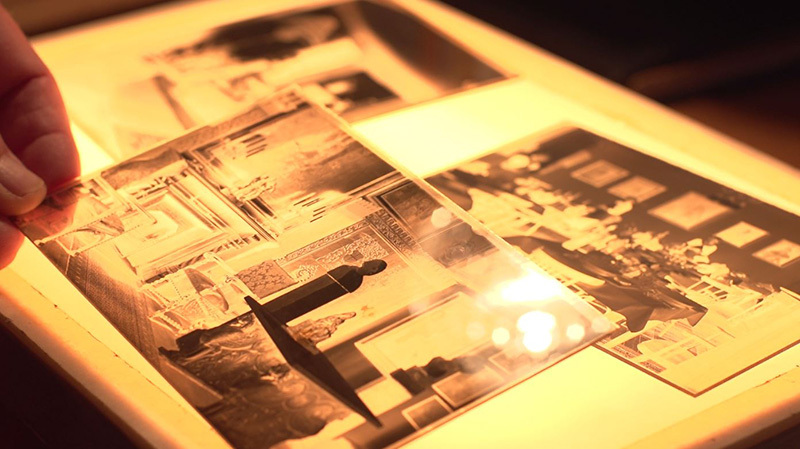 The resolution of the original photographs allows for enlargement, so that we can turn our attention to details that would otherwise likely go unnoticed – especially given the pace at which we tend to browse through images these days. Let us take note of gazes and events that, through our attention, blossom into fuller and more immediate human stories, also encompassing the viewers themselves.